"There are some things you can&apos;t leave behind... A broken-down camper hidden deep in a national forest is the only home fifteen year-old Carey can remember. The trees keep guard over her threadbare existence, with the one bright spot being Carey&apos;s younger sister, Jenessa, who depends on Carey for her very survival. All they have is each other, as their mentally ill mother comes and goes with greater frequency. Until that one fateful day their mother disappears for good, and two strangers arrive. Suddenly, the girls are taken from the woods and thrust into a bright and perplexing new world of high school, clothes and boys. Now, Carey must face the truth of why her mother abducted her ten years ago, while haunted by a past that won&apos;t let her go... a dark past that hides many a secret, including the reason Jenessa hasn&apos;t spoken a word in over a year. Carey knows she must keep her sister close, and her secrets even closer, or risk watching her new life come crashing down." -- Provided by publisher. 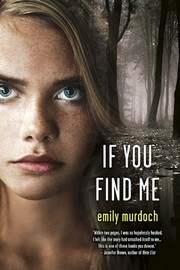 If you find me / Emily Murdoch. 100 ME:PersonalName 1 $a Personal name Murdoch, Emily. $c Statement of responsibility Emily Murdoch. 655 IT:Genre 0 $a Genre/form data or focus term Domestic fiction.